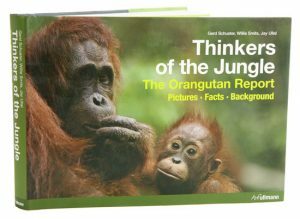 Thinkers of the jungle: the Orangutan report. Artist/Author: Schuster, Gerd et al. An exceptional insight into the way of life of a unique and very special endangered species based on the latest research on the subject. We all recognise these highly intelligent and impressive animals – Orangutans. But very few people know anything about how they live and their habits. Around 6,000 of these animals die every year; they are among the world’s most endangered species despite sharing 97% of its genes with humans! This book reveals the plain truth, and the tragedy of what is happening in the jungles of Borneo and Sumatra becomes apparent to all. The breathtaking and moving photographs cannot fail to trigger a strong emotional reaction on the part of the reader.